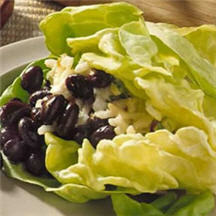 Lettuce leaves are used to wrap black beans and chives with a tangy brown rice and cheese mixture. Your guests may vary their wraps as they like.This appetizer is fun and easy. Set BUSH'S BEST Black Beans and chives in separate shallow bowls. Combine rice, salad dressing and cheese in small bowl. Scoop into third shallow bowl. Set leaves on plate and allow guests to create own lettuce wraps. Recipe and photograph provided courtesy of Bush's Beans.